A boy, a robot, a race car and a remote. Does life get any better than this? This is a brightly illustrated, engaging and fast-paced story about two friends. Robot has built a race car and now he wants to take it for a spin. Crash. Crash. 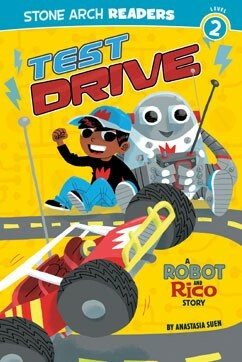 Rico would really love to have a turn to drive it but will he get a chance before Robot crashes the car and breaks it into smithereens?